What if we developed a vaccine against “received ideas”? It’s simple: let’s invent “Factual Intelligence” and all play online fact-checking. Let it become a sport, a real pleasure and even a reflex! Every prejudice smashed will be one small step for a man, but one giant leap for mankind. “The love of facts is the light of intelligence that separates the true from the false,” said Gouri Glogenflobish. Today, nothing is closer to truth than falsehood. The bigger the lie, the more it will be believed online. The fewer the facts, the stronger the opinion. What a sad era when it is easier to smash an atom than a prejudice! One thing that’s new that is a little concerning is people seeking out things online that are really not giving them the facts, and then staying in there. We are going through this period of time right here where unfortunately some of the people that are winning are the people that spend their time trying to get the most clicks, not telling the most truth. Result: the very concept of objective truth is fading out of the world and lies are passing into history. Could humans be less wise than birds? Yes, we can! What if we could put a “Factual Intelligence” app on our smartphones? I am 16 years old and I care about climate justice and the living planet. We are waging war on nature, and if we win, we are lost. 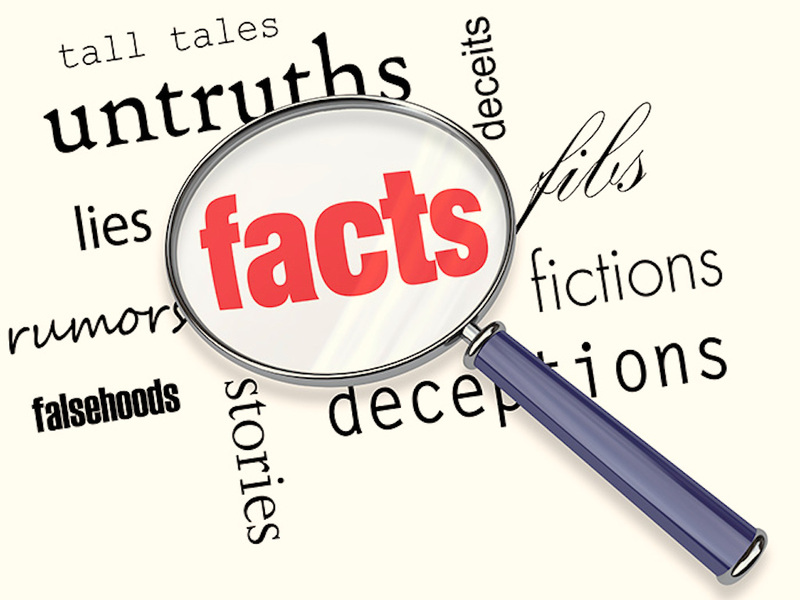 Facts do not cease to exist because they are ignored, whether we’re ignoring them willingly or not. There are no passengers on Spaceship Earth. We are all crew. If we end the ability of a healthy natural world to sustain humanity, will anything ever matter again? We must reinvent a future free of blinders so that we can choose from real options. Our house is on fire and we’re not paying attention. For democratic debate to work, we have to actually believe in an objective reality. We have to believe in facts. Without the facts, there’s no basis for cooperation. The Web does not just connect machines, it connects people. It’s ignorance, not knowledge, that makes enemies of people. Ignorance leads to fear, fear leads to hate, and hate leads to violence. That’s the equation. Too often, online, we hold fast to the clichés of our forebears and we subject all facts to a prefabricated set of interpretations. There is nothing which deceives us as much as our own judgement. What if we only believe in what has been proven? Individually, none of us knows as much as we all know together. For the future, our collective choices must reflect our hopes for a healthy planet, not our ignorant fears. Essentially, we are all ignorant, but on different subjects. What if verified facts become super easy to find online? What if we formed a “fact-loving hive mind,” to find out? A fundamental question is becomingly more and more pressing: Will the contemporary planetary crisis end as a result of the determined action of Earthlings, or because Earthlings have become extinct? In general, online opinion is just what people think about what other people think. So, think different? Let’s all play online fact-checking! Just do it! If everyone had been against evolution, man would still be in a dark cave suckling from domestic grizzlies! Long Live the Light of Verifiable Facts! “Darkness cannot drive out darkness; only light can do that,” said Martin Luther King. The light of science often replaces private prejudice with evidence that is publicly verifiable online. Science knows no country, because knowledge belongs to humanity: it’s the little light that illuminates the world. Unite behind it, talk to the scientists and listen to them, please. What If the World Fell In Love With Facts? I dream of a world in which the love of facts will no longer be extraordinary. Sometimes it’s the very people who no one imagines anything of who do the things that no one can imagine, and I don’t necessarily agree with everything I say, but I think what is most important is constantly being jeopardised by trivia, and freedom of action begins where ignorance ends, and that’s that. The greatest danger to our future is apathy. What if the world suddenly fell in love with facts, to find out?! Gouri Glogenflobish, Albert Einstein, Joseph Goebbels, Arnold H. Glasgow, Bill Gates, Tim Cook, George Orwell, Confucius, Barack Obama, Mr Trololo, Greta Thunberg (16 years old), Hubert Reeves, Aldous Huxley, Marshall McLuhan, Harrison Ford, David Suzuki, Jacques Chirac, John Lennon, Tim Berners Lee, Kofi Annan, Averroes, John F. Kennedy, Leonardo da Vinci, Isaac Newton, Euripides, Nelson Mandela, Georges St-Pierre (GSP), William Shakespeare, Donald J. Trump, Charles Darwin, Alfred Austin, Steve Jobs, Gary Mark Gilmore, Hergé, Boris Vian, George Bernard Shaw, William K. Clifford, Vivian Maier, Martin Luther King, Leonard Cohen, Richard Dawkins, Louis Pasteur, Félix Leclerc, Hannah Arendt, Jeffrey Lebowski, Alan Turing, René Char, Victor Hugo, Neil Armstrong and Jane Goodall. What’s true and what’s false?